The self-deprecation. (“Relax, I’ve done dirtier things than this”— a reference to the dirty streetwalker he tried to “do” in Miami). Yet it all comes across as a pale copy of what he’s done before. Vince’s first two infomercials, the ShamWow and the Slap Chop, had a kind of offbeat energy combined with naughty (for an infomercial!) humor. 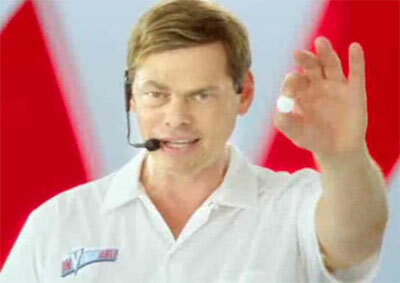 And the Schticky managed to skillfully send up Vince Offer’s pop-culture persona. Perhaps he is dispirited at having to work as a pitchman again instead of enjoying a career as a major Hollywood filmmaker, but Vince Offer seems to be just going through the motions with InVinceable. Aero Knife: Is Anthony Sullivan Trying to Be the Next Vince Offer? He seems like he’s being impaired by some sort of a medical condition. Or the Prostitute really TORE HIM UP. Too bad his nano-second “cameo” (in truth a clip from one of his infomercials) in Iron Man 3 didn’t pan out for him. One of the more strange and typical parts which is the now known useless headset he’s always wearing seeing that he removed it and we could hear him just as well. 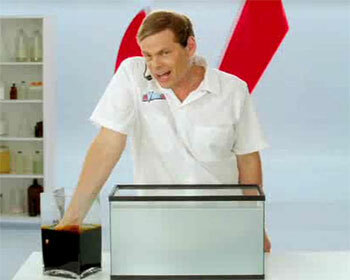 For those not already aware, Vince “Offer” Shlomi did in fact have a stroke prior to his ascent to infamy in the original ShamWow advert. That’s why he always wears the headset no matter what he’s pitching. I actually like the spray bottle that works upsidedown… where can you get those? If you are thinking of ordering this product. be very certain you want to keep it because the risk free cash back warrenty is a scam. I paid $75.00 for three of these packages and I returned the product a couple of days after receiving them and I was refunded $31.50. Customer service told me that the difference was for shipping and handeling. I ordered buy 1 get one free” and was charged $23.90 twice. Total of $47.80. What a rip off. You get 2 little packets of the “stuff”, about the size of 1/2 of a pencil and 2 Sprayers in each box. The “Free” one cost me an additional $23.90. Naturally I can’t get hold of anyone ’cause it is Sunday. I WILL be on the phone to them tomorrow to get instructions for returning the whole mess and will contact my Credit Card company to claim fraud tomorrow too. Buyer beware! Always watch out for “plus shipping”, or “refund minus shipping”. Sometimes the shipping is as much as the item itself. Notice when they say “get one free”, they often say separate shipping/processing for the “free” item. Even if they send you a refund, they make a profit of $20 or more for stuffing it in an envelope. A $20 product is probably worth $1.00 to begin with.